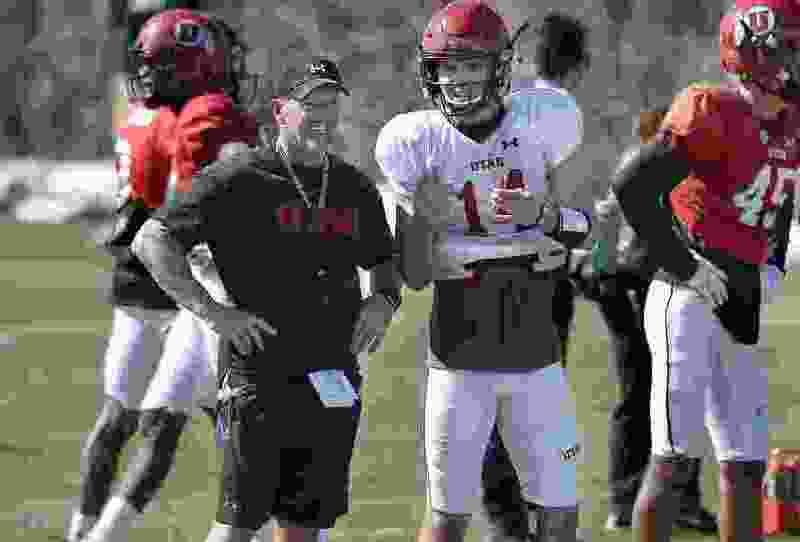 In wake of Jack Tuttle’s departure from Utah, will star freshman quarterbacks continue look elsewhere if playing time isn’t, well, immediate? Scott Sommerdorf | The Salt Lake Tribune QB Jack Tuttle talks with head coach Kyle Whittingham at Utah spring football practice, Saturday, March 10, 2018. The future left on a Wednesday night. It was a stunner, and it still is. The why must wait. The judgement shall, too, although many fanatics have already digested the news in their own fanatical way. A personal decision, by a teenager no less, shouldn’t receive the sort of venomous blowback accompanied by the news of another college football transfer in 2018. Too often, however, they’re cast as quitters or fame-seekers elsewhere, in different colors, in a different helmet, in front of different fans. A smooth 6-foot-4, 200-something pocket-passing QB who could make all the throws. Ask around, and that football-specific catchphrase perhaps leads to the root of what has become a trend around college football. Student-athletes having what it takes, being told by those in their inner circle they’ve had it since Day 1, and doing whatever it takes to get under center or in shotgun formation as soon as possible. That’s not an indictment on Tuttle or any kid who chooses to move on. That’s just the nature of things now, former coaches, players and those covering the money-making monster that is college football say. Young quarterbacks want to start. And they have leverage. According to the Associated Press, eight of the top 20 QB recruits from the class of 2016 have transferred. Four of the top 20 from the 2017 class have already left teams they initially signed with. It’s not a blip. No, it’s just the beginning, they say. And it’s not the worse thing ever, because odds are, your team might benefit down the road. Sooner than later, too. It’s now-or-never. Or at least that’s the mindset. For so many college quarterbacks, they’re facing the daunting prospect of winning the job outright now, and then finding a way to stave off whatever next hotshot signal-caller enters the program in the coming seasons. Once the hunter, they immediately become the hunted as QB1. And if you’re waiting in the wings, like Tuttle was as a true freshman QB, and if you see the path to starting is perhaps a little longer than you thought, maybe you make an executive decision sooner than later. The quarterback position gets the most hype, most attention, most scrutiny, because there’s only one on the field per down. Rarely do you come across successful two-quarterback systems. As both Huffman and Auerbach explained, Jalen Hurts at Alabama is absolutely the exception these days, not the rule. You won’t find another national championship caliber QB who is willing to sit behind a younger, playmaking counterpart. (Trent Nelson | The Salt Lake Tribune) Utah Utes quarterback Jack Tuttle (14) as the University of Utah Utes host the Weber State Wildcats, Thursday Aug. 30, 2018 at Rice-Eccles Stadium in Salt Lake City. The narrative around transferring is changing, too. Ask Max Browne. A couple years ago, the former USC quarterback was told that Sam Darnold was going to be the guy a few games into the season. In a recent project for The Athletic, Auerbach delved into the fad of grad transfer QBs and how they make their decision to go basically wherever they want. Browne was one of those guys. He ended up at Pitt. No longer is the narrative that a player transferring doesn’t have the chops. Now you can become an immediate commodity on the national scene. For Tuttle, that’ll be somewhere else, never having played a single down for the Utes, having only helped signal in plays from the sidelines. Kyle Whittingham offered no clarification this week on the sudden exit of what was perceived to be the best QB recruit ever to land in Salt Lake City. He acknowledged the new rule allowing athletes to play in four games and still being able to redshirt a year perhaps becoming a factor later on down the line, but didn’t think it was a factor in Tuttle’s move. But has he found it more difficult to keep guys already in-house here and happy? 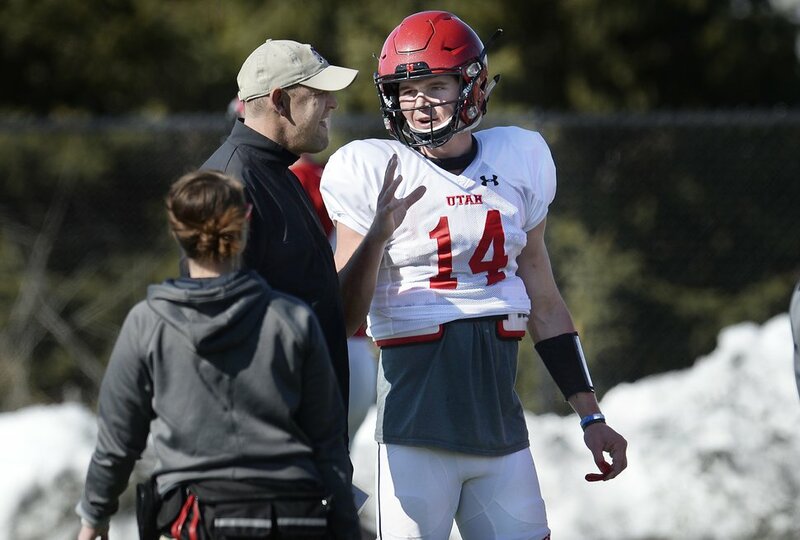 Scott Sommerdorf | The Salt Lake Tribune QB Jack Tuttle talks with offensive coordinator Troy Taylor at Utah spring football practice, Saturday, March 10, 2018. Meaning: Quarterbacks are always the prize, but there’s almost never a guarantee. Tuttle was tabbed as a future superstar at Utah, a guy some analysts believed to have first-round draft potential. Instead, last week Whittingham was prepping for a visit from USC while dealing with the departure of a QB the Trojans were once hot after. Two days before news broke that Tuttle was leaving, a new NCAA transfer portal was opened, where there’s a list of student-athletes who have plans of transferring can be accessed. Truth is, it’s easier now more than ever to switch programs. BYU coach Kalani Sitake said attrition is part of football, whether it be playing time, personal factors, academics, whatever. The hardest part of dealing with movement in today’s game is when a player is somewhere they don’t want to be. Tuttle’s main recruiter at Utah, Aaron Roderick, is now part of the offensive staff at BYU. He was fairly straightforward in his assessment of the state of transfers in the sport. The rise of playing young quarterbacks is due to kids being more ready to play major snaps immediately. Most high-profile prep QBs have worked with private QB coaches, are seen in various 7-on-7 tournaments and get attention due to brand-sponsors camps like the Elite 11 quarterback camp. And as Browne explains, kids are exposed to breaking down coverages and learning passing concepts at 12 or 13 instead of 16 or 17. “That allows them to speed up,” he said. Back in spring, Tuttle said arriving in Salt Lake was “just like basically coming to another home for me.” He was all smiles. He did post-practice yoga. He was getting schooled in Troy Taylor’s offensive schemes when he could’ve been living out his last few months as a high school senior. “Mature beyond his years,” Whittingham said of Tuttle in March. Heck, Tuttle even went to the airport to welcome receiver Britain Covey home from his mission for The Church of Jesus Christ of Latter-day Saints. Yet, he’s gone. And questions will linger. Would making Tuttle No. 2 have mattered? Would at least a debut in mop-up time inside a packed Rice-Eccles Stadium have helped sway him to stick it out? Would a taste have changed his mind? (Steve Griffin | The Salt Lake Tribune) Utah quarterback Jack Tuttle fires a pass downfield during the University of Utah football team's first scrimmage at Rice-Eccles Stadium in Salt Lake City Friday March 30, 2018. Tyler Huntley knows first-hand what life on the bench is like. 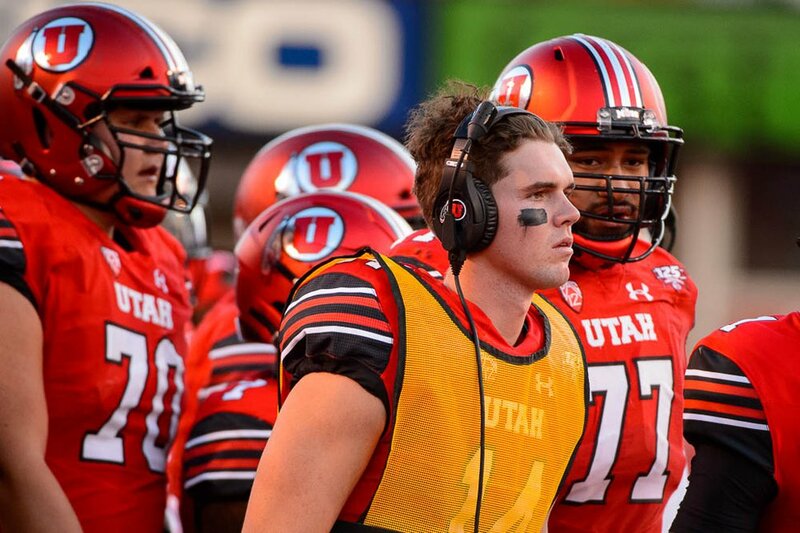 During his freshman year at Utah, he was that guy watching, studying, headset on, helping call in plays. The junior quarterback said this week that there were tough times back then, thinking he could maybe do more. “You work through that, he said. This isn’t the first time Utah has seen a QB transfer. Far from it. Nor will it be the last. It’s just that the timing of it was a shock, and Tuttle seemed enamored with life in Ute red. But that’s the cycle these days. Coaches, always in search of security, may opt to go with the younger QB who might have more upside, who might be at the program longer, who might be able to add elements the incumbent could not. Tuttle’s social media accounts are now free from Utah-related posts. His most-recent Instagram post came on September 30. The former Ute QB is looking out on a Salt Lake Valley sunset. The caption reads: “Life can only be understood backwards; but it must be lived forwards.” In the comments are a slew of fans from all over the country pleading with Tuttle to come QB their favorite program. And even some Utes fans, still begging him to stay. December 2016 • Commits to Utah after junior season at Mission Hills High School in San Marcos, Calif.
December 2017 • Signs with Utah during the NCAA’s December window. January • Enrolls at Utah after graduating early from high school. Aug. 27 • Listed as the No. 3 quarterback on the first depth chart issued after preseason camp. Oct. 16 • Goes through practice on the final day of weekly media availability. Wednesday • Transfer plans first reported by the Ute Zone website, confirmed by The Tribune. Tribune reporter Jay Drew contributed to this story.